After Constantia, Stellenbosch is the second oldest wine region of South Africa. Mostly known for its red wine production, it also produces some fantastic whites. Let’s dive into this wine region together. 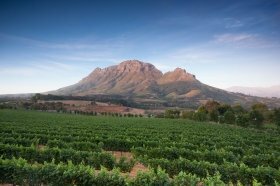 Stellenbosch is the name of a town in South Africa, which sits about 50 miles from the famous city of Cape Town. The town, just like Cape Town, sits at the foot of a large mountain range called Stellenbosch mountain. WHAT IS THE HERITAGE ? The Governor of the Cape Colony, Simon van der Stel founded the city in 1679. He named the city after himself – Stellenbosch means “(van der) Stel’s Bush”. A few years later, French Huguenots, seeking refuge in the Cape, started planting vines. The region soon became a thriving wine producing wine region. It is still today very active, and renown wine region, probably South Africa’s most famous region. And it produces wines that can really shine on a world stage. The region’s climate is relatively Mediterranean (mostly hot and dry). A cooling breeze coming from the sea blows through the vineyards in the afternoons. This helps to keep temperatures cool during summer. White-wine varieties are often planted closer to the ocean where this effect is more pronounced. WHAT ARE THE MAIN GRAPE VARIETIES OF STELLENBOSCH ? As mentioned briefly, the region produces mostly red wine. Cabernet Sauvignon is the most planted red grape. It is often blended with other red grape varieties such as Merlot. These blends have good ageing potential, and can be kept for several years. Cabernet Sauvignons from Stellenbosch are usually full bodied wines with intense colours and deep red fruit aromas. Syrah is another grape variety that produces luscious wines with rich aromas of blackberries and spices. Then there is South Africa’s national black variety: Pinotage. It is a crossing between Pinot Noir and Cinsault (called Hermitage in South Africa). Pinotage is often controversial as it can have paint-like aromas. However, done well, it produces richly fruity, full-bodied wines that are fantastic with food. In terms of white grape varieties, the most popular is Chenin blanc. There are also plantings of Chardonnay and Sauvignon Blanc. Winemakers in Stellenbosch often age their Chenin Blanc in oak barrels. As a result, the wines are wonderfully fruity and creamy, with aromas of baked apple, vanilla and honey. The region is also experimenting with new varieties such as Malbec, Viognier, or Nebbiolo. Here are five fantastic examples of the variety that this region can produce. Do go out and try these (and others of course) to get a sense of what Stellenbosch has to offer.